[1:20] <LuisLeite> Vialas, over there? [2:11] <Cheekio> tips and tricks for using raspi without a mouse? [2:12] <[Saint]> Get a decent power supply. [2:12] <[Saint]> ...or that, yes. [2:12] <alusion> do I just boot on pi? [2:15] <[Saint]> backlit keyboards and wired optical mice can have silly demands sometimes. [2:16] <taza> Cheekio: Only 750mA of your RPi power gets used. [2:17] <taza> Unless you have a powered hub, obviously. [2:18] <[Saint]> taza: ...errr, the pi uses ~700mA without peripherals, but it can make use of more than that from the power supply. [2:20] <Cheekio> [Saint]> Get a decent power supply. [2:20] <taza> Aaaand he's slinging insults at me in query. How... new. [2:20] <Cheekio> Yeah, that was pretty much an insult/wrong as the first response. [2:20] <taza> Cheekio: If it does 750mA reliably, it cannot do anything more. [2:21] <taza> The reason people say 2A is 'cause most supplies rated at 750mA don't get close. [2:21] <Cheekio> is the default user 'pi'? [2:21] <taza> It's on a wiki somewhere. [2:21] <pksato> Only RPi need less that 470mA. plus 280mA for usb, get 750mA. [2:22] <[Saint]> Assuming my peripherals aren;t just plainly lying, it apparently can survive with a lot less. [2:23] <[Saint]> Assuming everything attached is drawing its limit, there's about 300mA left for the pi to run on and I don;t see how that could boot. [2:23] <taza> That's a whole lot of assumptions. [2:24] <pksato> after PSU, other issue is micro USB cable, some use so tiny wires, causing high voltage drop. [2:24] <taza> But this problem is overwhelmingly likely caused by the wireless adapter just being too power-hungry to be powered through the Pi. [2:25] <Cheekio> is there an advantage of using the circular plug over microusb? [2:25] <taza> ... wait, what circular plug? [2:25] <Cheekio> Op, no, that's a video out. [2:25] <taza> Yeah. I was thinking. [2:25] <Cheekio> I kept registering that as a power input. [2:25] <taza> Connecting a power supply there is a baaad idea. [2:25] <[Saint]> that's VGA, not DC in. [2:26] <taza> Most people get a powered hub that doesn't backfeed. [2:26] <[Saint]> yeah - don;t apply power to that. it probably wouldn;t be fun. [2:26] <Cheekio> So... what else am I looking at? [2:26] <taza> There's some safety problems with back-feeding USB hubs. [2:26] <taza> ... honestly, the default data oughta be on the site, under FAQs. [2:27] <Cheekio> now a powered usb hub. I feel like I missed an important 'this is what you need' guide. [2:27] <taza> Basically you need a powered usb hub to make wireless work. [2:29] <pksato> for safe use, powered usb hub is recomend. If you are not afraid of smoke. you can power RPi from GPIO or USB ports. [2:29] <taza> Yeah. Backfeeding also can cause smoke. [2:29] <taza> ... also. pksato's "usb ports" actually means that. [2:30] <Cheekio> Any recommendations for a powered usb hub? [2:31] <pksato> like in rush current. [2:32] <taza> Cheekio: The default image does support SSHing right in, but there's no guarantee the wireless adapter installed properly. [2:33] <pksato> can solved replacing or adding some Low ESR capacitos. [2:35] <taza> And now you just need to get in to install the driver, heh. [2:35] <[Saint]> taza: lets approach this a different way - can you show me the devine guideline outlining draw greater than 750mA is impossible? [2:35] <[Saint]> I ask because I find a lot of information that disagrees with this. [2:35] <[Saint]> Rather a lot. [2:37] <pksato> outdated blog post. [2:37] <pwillard> I really like the D-LINK DUB-H7 powered HUB. It has 2 POWR ONLY sockets. [2:37] <[Saint]> taza: 750 doesn;t appear on that page at all. [2:38] <pksato> original F3 polyfuse is rated to 750mA. [2:38] <[Saint]> "The microUSB input port also has a 1.1 A polyfuse"
[2:39] <pwillard> Element14 reccomended WIPI wireless adapter... I'll never trust them again. [2:39] <SpeedEvil> It's intentional, not an oversight. [2:39] <pksato> If F3 are replaced by 1.1A, is not my fault. [2:39] <Triffid_Hunter> SpeedEvil: it's intentionally crippled in a way that pisses basically everyone off? [2:40] <Cheekio> Who redeems the warranty on a $35 computer? [2:40] <SpeedEvil> Cheekio: people who have problems affording things. [2:40] <[Saint]> SO...its more correct to say "current draw /might/ be limited to ~700mA, but if you purchased semi-recently it probably isn;t" I see. [2:41] <taza> [Saint]: There's no telling which version of the hardware you have without taking a multimeter to it. [2:41] <taza> Cheekio: If you wanna go the soldering iron route... have fun, but read up. It'll work, but honestly, I don't want to risk the smoke. [2:45] <taza> The Pi has a lot of rookie mistakes, and a lot of problems resulting from lack of manpower and organization. [2:45] <taza> But hey, it works. So, better than the OUYA. [2:45] <taza> And it's a reliably $50 computer, actually pretty good for the stated purpose. [2:50] <pwillard> Personally, I would never have designed a board with I/O ports on all sides. [2:53] <pwillard> I would have much preferred a board with one side like a MicroATX... Making it easier to insert into standard off the shelf cases. It probably would not need to have been as *deep*... just longer... But, I get it they were aiming for close to credit card sized. [3:38] <taza> Good luck. Remember to read up on the design, it's already been tried a lot. [3:57] <Cheekio> apparently I only have 330 ohm and 10k resistors, no 1ohm. [4:43] <SpeedEvil> You do know that without GPU accelleration, capabilities will be extremely limited? [4:47] <Bozza> Triffid_Hunter: what is that mod? [4:57] <gkwhc> Hi everyone, I know this is a raspberry pi channel, but would anyone happen to be familiar with preemptive RTOS, like BIOS from TI? [4:58] <gkwhc> oh cool, is it preemptive based? [5:01] <rikkib> Are you using dma? [5:06] <rikkib> Are you working in asm? [5:10] <gkwhc> have you done much with it? [5:12] <rikkib> One of those round 2 it project that I have one to many of. [5:15] <rikkib> I have other TI dsp boards as well. Old school ones. Again asm, something I have tried to get away from in favor of C with maybe embedded asm. [5:22] <rikkib> How do you manage the transfer rates? SD cards are perhaps slower than the D/A hardware. [5:25] <gkwhc> what was the manual way, btw? [5:30] <gkwhc> "not enough sleep time"..so there is an issue with context switching? [5:31] <rikkib> It is a balance of between responsiveness and performance. [5:47] <sandman> Any idea on when Wayland will be ready? [5:50] <clever> what is wayland again? [5:50] <clever> does it support raw framebuffer? [5:52] <clever> sney: would it still be using the framebuffer interface, or using the opengl api to make the gpu do things for the app? [5:57] <sney> hmm. but like the pi, nobody has that? [6:34] <sandman> Does prelink do any good on a RPi? [6:38] <clever> shiftplusone: you about? [6:41] <nerdboy> what are you running? [6:55] <sandman> nerdboy: Sounds like headaches. [6:59] <sandman> Anyone else get segfaults with Midori? I heard someone apt-get --purge autoremoved it, along with a bunch of webkit stuff, then reinstalled, and then it worked. [7:13] <sandman> It would appear raspbian isn't as updated as I'd like. [7:20] <nerdboy> by next week maybe? [8:40] <Sepultura> anyone knows how much a 2D Barcodescanner Module for Raspberry Pi costs? [8:44] <UziMonkey> use the pi camera and opencv? [8:46] <Sepultura> UziMonkey: Is a webcam good to catch QR codes? [8:49] <Sepultura> any good chassis for Raspberry with integrated Keyboard? [8:51] <Sepultura> and to build own plastic chassis? [9:46] <Sepultura> UziMonkey: need to look for one who has a 3D Printer. [10:18] <ElTimo> I'm trying to get DLNA working, but minidlna can't seem to see the files I want to share. [11:08] <shiftplusone> using those dinky usb asic miners? [11:08] <FR^2> Okay, okay, I was just kidding. [11:09] <BillyZane> hi, i've got a question regarding the pins on the raspberry pi, what are they used for? [11:09] <shiftplusone> BillyZane, they're "general purpose". If you have the know-how, you can connect anything to them. [11:10] <shiftplusone> FR^2, I've been running the block eruptor for like a month. Made about a dollar... so.... yeah. [11:10] <Pitel_IPEX> can I safely remove old kernel directories in /lib/modules? [11:10] <BillyZane> shiftplusone, are they serial or analog connectors? [11:11] <shiftplusone> BillyZane, there is one uart... you also have spi and such, but no analog. [11:14] <shiftplusone> FR^2, yup... seems like you need to invest thousands into equipment which will be obsolete in a few months to even have a chance. [11:15] <Jck_True> 1) Write a bitcoin miner in JS 2) Put it on your webpage 3) ???? 4) PROFIT! [11:15] <BillyZane> is it possible? [11:16] <Jck_True> BillyZane: Well that board supports USB - So why not just hook it up there? [11:17] <BillyZane> how come it does not have 5v? [11:20] <clever> BillyZane: also, do you need to connect the tx on the servo controller? [11:20] <clever> or just rx? [11:21] <shiftplusone> BillyZane, the pi is not good for real-time applications, so if you need fine control, an arduino is better. [11:22] <Jck_True> Well - The board you linked supports USB - So why not just use that? [11:24] <AlanBell> BillyZane: what are the servos going to be doing? [11:25] <zaccanasta> hi guys, is it possible to cross-compile a qt app for raspberry pi? [11:26] <clever> 4: just use usb! [11:26] <shiftplusone> zaccanasta, it's possible to cross-compile anything if you know how. [11:27] <shiftplusone> zaccanasta, unfortunately I don't know the best way for qt. I'll take a look. [11:30] <BillyZane> how exactly do i write to it? [11:30] <BillyZane> like using a text editor? [11:32] <shiftplusone> zaccanasta, it looks like it's fairly standard. Get a cross-compiling toolchain (there's one on github from raspberrypi) then set the relevant environment variables if you're compiling from terminal or configure qt creator to use the right paths and compiler if you're using that. [11:32] <BillyZane> and i can control all sorts of stuff in there? [11:32] <Firehopper> there are lots of things in dev..
[11:32] <BillyZane> and i can write in any language i want? [11:32] <Firehopper> there are some files theres you dont want to mess with..
[11:33] <Firehopper> including your sd card..
[11:33] <Firehopper> and that can mess things up..
[11:35] <clever> Jck_True: ooo yeah, doh! [11:38] <clever> BillyZane: nearly everything in linux is a file! [11:40] <shiftplusone> clever, thanks... I may give it a skim as well. [11:42] <clever> Firehopper: at a glance, i think its an android with an avr stuck on the side, with the option to also boot normal linux? [11:42] <clever> and both cores fully programmable? [11:43] <Firehopper> and yes you can program both sides. the imx runs either linux or android..
[11:44] <clever> oh, not the avr branch of arduino? [11:44] <Firehopper> same cpu as the due..
[11:44] <Firehopper> and it can be programmed from linux on the imx, its connected directly to the imx. [11:45] <Firehopper> it can also be programmed from a pc connected to the one header..
[11:48] <clever> Firehopper: hdmi to lcd adapter? [11:53] <clever> Sonny_Jim: how do you manage the sync? [11:57] <clever> Sonny_Jim: you know how /dev/random works? [11:59] <clever> does it cover several presses, or just the last one? [12:15] <baseline> I have an external hdd formatted to ext4 for additional storage. I'd like to move my root to a new partition. Will there be any issues if my root fs is the second partition on the drive instead of the first? I've got a lot of data on the drive that I can't really be bothered to juggle about to repartition completely. [12:15] <Tachyon`> why is it audacious and so on refuse to produce audio on the pi? [12:16] <Tachyon`> it's setup for ALSA, is that not what it uses? [12:16] <baseline> Habbie: I didn't know that :) Any tips on where to find out more? [12:16] <Habbie> baseline, on 1 or on 2? [12:17] <baseline> Do you mean figurately rename the partition numbers, or literally move sda2 before sda1 on the disk? [12:17] <baseline> and that will preserve data? [12:18] <Habbie> if you make no mistakes. [12:18] <baseline> it's just a media storage drive. There's nothing important on there. [12:20] <baseline> Would there be any benefit to resizing /boot to 2GB? [12:22] <baseline> Cool. I'm a bit wary of doing these things manually, I usually use gparted for this stuff. I'll check it out in a bit! [12:30] <baseline> clever: Is there something more reliable than gparted? [12:32] <baseline> clever: you have 4 drives hooked up to a pi? [12:34] <baseline> Would I be less susceptible to that with just /boot on there? [12:35] <clever> shiftplusone: how recent, what changed? [12:36] <shiftplusone> clever, about a week or so, maybe a bit less. They're running mmc off the same clock as the gpu, which helps with timing issues I think. [12:36] <shiftplusone> baseline, yeah, that sounds right. I haven't looked into the details. [12:43] <baseline> isn't the pi supposed to cost a few pounds a year to run? [12:50] <baseline> You have a machine accessing it's root over a network? [12:51] <baseline> How did you rig that up? nfs? [12:57] <baseline> better wash and shave now because the next few days are going to be messy. [12:59] <baseline> What distros do you use, clever? [13:00] <baseline> the arch wiki makes wake on lan seem fairly simple. [13:01] <zyngawow> Does anyone know of a case for the RPi + HDD? [13:08] <clever> its getting so late, its early! [13:24] <shiftplusone> Tachyon`, it certainly used to be the case until the foundation invested money into better software. [14:20] <ReggieUK> so it's still popping or fixed? [14:20] <shiftplusone> haven't tried it myself, but from what I am seeing on the channel, it's fixed. [15:09] <baseline> but gparted shows a 31.5KB ext4 partition, 3 28KB unknown partitions, 3 256KB unknown partitions, 1 123MB unallocated partition and a 465.64GB unknown partition. [15:10] <murlock> what are kernel logs in dmesg when you plug your HDD ? [15:11] <baseline> murlock: Where am I looking for this on ubuntu 13.10? I'm not used to it. dmesg? [15:14] <baseline> pretty much the same as yours but with 1 partition listed. [15:18] <IT_Sean> I was just testing that. [15:18] <baseline> hmm.. it's apple partition map. [15:42] <pepijndevos> i attached a vga display to my raspi using an adapter, but nothing happens. [15:43] <pepijndevos> do i need to do anything special? [15:43] <pksato> taht kind of adapter? [15:44] <pepijndevos> wat? why not? I have a dvi -> vga adapter. [15:44] <pksato> pepijndevos: you need a active hdmi to vga conveter. [15:57] <pksato> pepijndevos: jack audio have some residual noise from pwm. [15:57] <pepijndevos> pksato, you mean it'll sound this bad allways, not matter what I do?? [15:58] <pksato> on software, yes. [15:58] <pksato> its is not hi-fi output. [15:59] <pksato> new firmware hve better noise reduction and improvements. [16:02] <pksato> teens can hear high frequencies. That adults can not. [16:04] <pksato> pwm have high frequency hiss. not proper filtered by simple RC filter that have on jack audio circuity. [16:08] <shiftplusone> hm, that might be it, I suppose. [16:16] <sandman> Can anyone tell me how to build prelink in such a way that it actually works? [16:17] <sandman> I tried downloading the latest tarball, the 2013, ./configure && make && checkinstall, but it still gives the same error about dual-libs. I read something about a patch being sent upstream about this from 2011 or 2012. The latest tarball is from 2013 so I sorta hoped it would have been included, but apparently not. [16:22] <baseline> I have no idea what's wrong here. I've tried several different versions of gparted..
[16:26] <shiftplusone> tried using something other than gpt? [16:26] <baseline> shiftplusone: What else is there? [16:27] <baseline> It's an old drive that was originally formatted for a power mac. [16:30] <baseline> Screw it, I'm going to have to recover the data and reformat. [16:42] <rogerjames99> Anyone had any success setting up locales on archlinux. When I run locale-gen for en_GB I get an out memory error. This is on a clean install. [16:43] <shiftplusone> I've never had any problems with locale-gen.
[16:44] <rogerjames99> @shiftplusone - Do you swap set up or any different memory config options? [16:44] <shiftplusone> nope, just stock arch. [16:44] <rogerjames99> I meant do you _have_ swap set up sorry. [16:46] <rogerjames99> Thats confusing - just downloaded the image, ran it, logged in to root , uncommented en_GB.UTF-8 in /etc/locale.gen, and ran locale-gen, and it crashes. 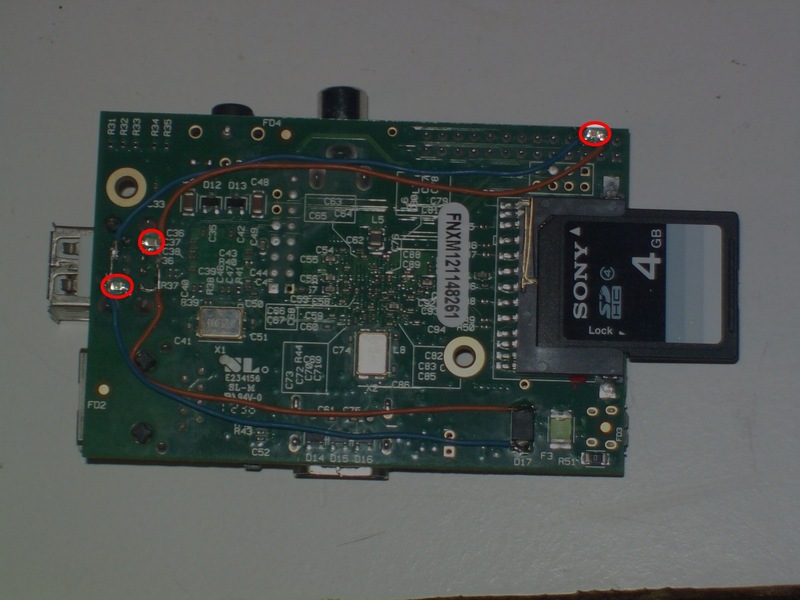 [16:48] <gvo> Is there a buried audio input port on the pi? [16:48] <Nefarious___> I'm wondering whether to sell my laptop for 4 raspberry pi B's. for a webserver (which may have a fair amount of hits) which would be more powerful, laptop (single core celeron 2.2ghz, 6gb ram) or 4 raspberry Pi's in parallel processing? [16:49] <Nefarious___> by a long way? [16:50] <chithead> how much does the laptop consume? [16:50] <gvo> I'd not want to run a web server on a laptop. [16:51] <Nefarious___> I have got a PC. [16:51] <gvo> Laptops aren't built for that. [16:51] <Armand> My laptop runs a lot longer than that.. but I'd not use it as a webhost. [16:51] <Nefarious___> chitgead: which bit? [16:52] <Armand> Nefarious___: There are better solutions for clustered webhosting. [16:52] <IT_Sean> Ran a home automation server off an old laptop for a couple of years, running 24x7x365. [16:52] <gvo> IT_Sean: is right, it's the heat that gets them. [16:52] <IT_Sean> The only thing that killed it was the 4ft of salt water from hurricane Sandy. [16:52] <IT_Sean> If not for that, it would still be percolating today. [16:54] * Armand cares not either..
[16:55] <IT_Sean> That is NOT recommended! [16:57] <Nefarious___> did you swear in PM? [16:58] <IT_Sean> thats what we in the programming business would call a "bug". [16:59] <IT_Sean> Nefarious_`PC: FIX IT. [16:59] <IT_Sean> I already reset my own offenses, nef... just fix the bot. [17:00] <IT_Sean> Also... i see an addop option... is there a way to remove an op? [17:00] <Armand> Better off handling Ops with Chanserv..
[17:00] <Armand> Ahh.. Fair enough. [17:01] <IT_Sean> s'all good Armand. [17:03] <Nefarious_> can someone add sourcebot to the proper Ops list so when it restarts or rejoins it gets Opped automatically? [17:04] <gvo> Is there a recommended audio player for the pi? [17:04] <shiftplusone> recommended by whom? [17:06] <gvo> By anyone. I mean I'm sure there are some that are just overkill for a small system. [17:06] <shiftplusone> by me, whatever you want that's sensible. For me, that's moc(p). [17:07] <gvo> not familiar with that one. I'll look it up. [17:48] <pepijndevos> how can I set up the raspi that if a wifi adapter is present, it'll create a hotspot? [17:48] <pepijndevos> For my cmus+gpio based mp3 player I'd like to be able to ssh in an modify the playlists. [18:47] <IT_Sean> If it is a grounding issue, it may persist, as (according to the USB spec) the hub and the pi would share a common ground (in theory). [18:48] <eurodata> IT_Sean: the sound is in pace with how the processor works, would that say something? [18:48] <IT_Sean> Not to me, sorry. [18:48] <eurodata> idle / work = different souds. [20:02] <gvo> How do I edit the gui menu? [20:07] <Serus> is rtgui the same as rutorrent? [20:08] <PyrO_70> does anyone knows about wiringPi ? [20:08] <Sonny_Jim> What's the question? [20:09] <gvo> Sonny_Jim: No luck with that. It's confined to system related things, not the user menu. [20:09] <Sonny_Jim> Let me guess, you are trying to run it during boot? [20:10] <Sonny_Jim> PyrO_70: Are you using rasbian? [20:10] <Sonny_Jim> That doesn't look like an error with wiringPi, do you have the code anywhere I can look at? [20:12] <gvo> Sonny_Jim: I mean the gui X menu with applications, graphics, sound, etc. [20:13] <gvo> The little funny icon on the bottom left of the screen when running in X. [20:14] <gvo> I went through all the preferences and didn't see anything. I right clicked on the menu but didn't find a way to add to the menu there either. [20:19] <Sonny_Jim> You realise what int means, right? [20:19] <Sonny_Jim> So, which pin are you trying to setup? [20:21] <PyrO_70> ok. why ? [20:22] <Sonny_Jim> What wiringPi number is GPIO5? [20:23] <Sonny_Jim> So, you want to call a function called 'callback' every time pin 5 goes High Or Low? [20:23] <Sonny_Jim> So where in that line you pasted does it say 5? [20:32] <gordonDrogon> maybe I back-ported the wiringPi pins page to projects... there is a printable pdf on the wiringpi site. [20:32] <gordonDrogon> you shouldn't need that, but maybe it's an omission in the code - I'll check. [20:36] <gordonDrogon> gpio 7 = wiringPi 7 - bcm_gpio 4. [20:37] <gordonDrogon> are you using Raspbian? [20:38] <gordonDrogon> it's looking for /usr/local/bin/gpio - that's where the gpio program is supposed to be installed into. [20:38] <gordonDrogon> if you ran ./build to install wiringPi that's where it will be. [20:38] <gordonDrogon> I'm guessing you did something else? [20:40] <gordonDrogon> what does the output of: which gpio give you? [20:41] <gordonDrogon> seems odd to me, but there you go. [20:41] <gordonDrogon> I'm sure they have their reasons. [20:42] <gordonDrogon> I do all my work under Raspbian. [20:46] <gordonDrogon> always space to learn something new, but Arch just doesn't feature in my life at all. Sticking to Debian here. [20:52] <gordonDrogon> got Debian everywhere - I guess it makes sense to stick to what you know! [20:55] <Serus> How heavy is apache? [20:56] <gordonDrogon> apache is fine on the Pi. [20:57] <gordonDrogon> but a lot of people are saiyn that lighttp is better. [20:57] <gordonDrogon> I used apache when I was experimenting - I'd probably use it again if I needed to - mostly because I've been using apache since day 1 or something like that. [20:58] <Serus> The pi is going to torrent a lot. [20:58] <gordonDrogon> oh. torrent a lot.. Hehe... good luck..
[21:17] <DEac-> but i do not know, how i can set the digits. [21:17] <gordonDrogon> what's the device? [21:18] <gordonDrogon> got a quick link? [21:23] <gordonDrogon> not familiar with it. [21:28] <zyngawow> Has anyone tried SportsDevil/Livestreams with OpenElec on the PI? [21:31] <DEac-> gordonDrogon: wiringPi uses i2c_smbus_access, like i2c-tools. i see, there is no function which provides something like that. [21:32] <gordonDrogon> DEac-, you ought to be able to write a byte to a register via I2C. [21:32] <deller> does the raspberry pi have any wireless connectivity? [21:33] <deller> how can i be sure? [21:33] <IT_Sean> how can you be sure of what? [21:33] <IT_Sean> if you want wifi, you will need to add a USB dongle. [21:34] <deller> no bluetooth, FM or anything? [21:34] <IT_Sean> The Model B has ethernet, but that is it. [21:34] <deller> what do you mean? [21:35] <gordonDrogon> wiggle a pin at 100Mhz and it's a transmitter. [21:38] <gordonDrogon> it should be doing the same as the i2cset command. [21:42] <gordonDrogon> if you can do it with i2cset, then you can do it with the wiringPi I2C helpers. [21:54] <DEac-> ah ok, very cryptic usage. [21:55] <Serus> Any rtorrent users? [22:40] <Nefarious___> as a webserver, ~ how many users could one pi handle hitting per minute? [23:10] * Firehopper watches batkid and tears up. so adorable. http://abclocal.go.com/wpvi/gallery?section=news/national_world&id=9327329&photo=1 < photos, if that doesn melt your heart, your not alive. [23:19] * SpeedEvil remembers an amusing image which he cannot post in here. [23:35] <Cheekio> and where they have F1 and F2 fuses, I have literally a hole. [23:35] <gordonDrogon> They had a Rev 1. [23:35] <gordonDrogon> You don't need it on a Rev 2. [23:36] <gordonDrogon> However if you're finding problems with the Pi's aboility to supply USB power, then you need a usb hub. [23:36] <Cheekio> Hmm. Are there hacks for the revision 2 board? [23:36] <ShadowJK> There's not that much power availabl, even with the USB fuses removed. [23:36] <Cheekio> not being able to power a wifi card seems like a gross oversight. [23:36] <gordonDrogon> if you're powering the Pi from the micro usb connector, then it's still limited to 700mA total. [23:37] <ShadowJK> So yeah, a powered USB hub is nice. [23:37] <gordonDrogon> get a better Wi-Fi card. there appears to be plenty that work. [23:38] <gordonDrogon> but if you're desperate and you have a PSU that can supply more amps, then it's easy to solder jumper wires from the �USB input directly to the USB sockets bypassing the polyfuse. [23:38] <Cheekio> Is there no fuse on the revision 2 model? [23:38] <gordonDrogon> there is still the input 700mA polyfuse. [23:39] <Cheekio> gordonDrogon, won't that fry the board? [23:39] <gordonDrogon> what do you think? [23:40] <gordonDrogon> especially if contemplating the old Rev 1 mod. [23:40] <Cheekio> Everybody's got to start somewhere. [23:41] <gordonDrogon> but all you'd be doing is the same as the Rev 1 mod - bypassing the polyfuse on the input - connect the input �USB directly to the main usb without going via the pcb. [23:41] <gordonDrogon> can't see how that'll fry the board myself. [23:42] <gordonDrogon> personally, I'd get one of the supported wi-fi dongles and use that instead. [23:43] <baseline> Can I dd a partition to a file, and then somehow expand the file inside another partition without overwriting the contents of the destination partition? [23:45] <gordonDrogon> you *will* overwrite the usb hdd. [23:45] <gordonDrogon> you have to - how else will it be there? [23:45] <gordonDrogon> you're not really making sense. [23:46] <gordonDrogon> if you want to use a USB HDD as the root partition for the Pi, you'll need to create a partition on it, format it ext4, then copy the current root over to it. [23:46] <baseline> basically I think I need to dd if=/dev/mmb.. of="backup-file", then if="backup-file" of="empty-ext4-partition"? [23:46] <gordonDrogon> you don't need to use DD to do that. [23:46] <gordonDrogon> I'd use rsync. [23:47] <gordonDrogon> so if you have an empty partition that's big enough, just rsync it over. [23:47] <gordonDrogon> it'll be faster and the partition size can be different. [23:48] <gordonDrogon> I question the saniy of having root on a usb device, but others seem to do it. [23:48] <gordonDrogon> just seems one more thing to go wrong to me. [23:49] <gordonDrogon> I use NFS myself. [23:49] <gordonDrogon> so all my stuff is on a server that all my devices then use. [23:50] <gordonDrogon> bit slow, isn't it? [23:51] <gordonDrogon> yea, I guess so. the single USB is the bottleneck though. [23:52] <baseline> Can I run the rsync command by you please gordonDrogon? [23:53] <baseline> rsync --progress --recursive -R . /dev/sdxx ? [23:54] <gordonDrogon> you need to mount it as rsync works on files, not block devices. [23:55] <gordonDrogon> I was using cpio before rsync was invented... some old stuff sticks. [23:56] <baseline> thankyou gordonDrogon. I'm sure I'll be back in a bit.